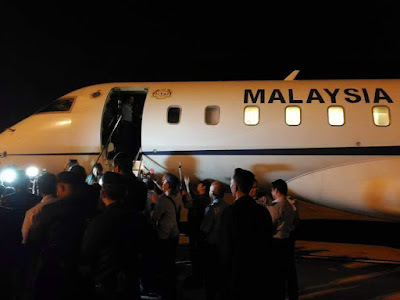 Alhamdulillah, the nine "hostages" in the KL-Pyongyang diplomacy row over matters related to the killing of Jong Nam, the North Korean leader's half-brother, are safely back in Malaysia a couple of hours ago. The North Koreans detained by us in retaliation would be reluctant to go home, I'm sure, but they are free to go, and so is the body of the body of the murdered half-brother. I couldn't care less about these two, what's important is the Malaysians are back and they are safe. I'm not privy to how PM Najib Razak plan to proceed with diplomatic ties and bilateral relations with North Korea but he will no doubt leave the matter in the Foreign Minister Anifah Aman and his team at Wisma Putra, who have taught us a thing or two about the art of international diplomacy. Kudos to them. 30th March 2017. I am pleased to announce that the nine Malaysians who had been barred from leaving North Korea have now been allowed to return to Malaysia. Alhamdulillah, they took off from Pyongyang today at 7.45pm Malaysian time, and will land in Kuala Lumpur tomorrow around 5am. 2. I would like to thank those in the Malaysian government involved in the negotiations, led by our Ministry of Foreign Affairs.‎ I had a deep personal concern about this matter, and we worked intensively behind the scenes to achieve this successful outcome. Many challenges were overcome to ensure the return of our fellow Malaysians. The safety and security of our citizens will always be my first priority. 3. We will now allow North Koreans to leave Malaysia. In addition, following the completion of the autopsy on the deceased and receipt of a letter from his family requesting the remains be returned to North Korea, the coroner has approved the release of the body. 4. The government believes strongly in the principles of justice and sovereignty. Our police investigation into this serious crime on Malaysian soil will continue. I have instructed for all possible measures to be taken to bring those responsible for this murder to justice. 5. As Prime Minister, I am grateful that all Malaysians united to overcome this crisis in the spirit of Negaraku. It shows what can be achieved for the nation if we work together as one. 1. Delegations from the Democratic People's Republic of Korea (DPRK) and Malaysia recently held a meeting in Kuala Lumpur to resolve issues arising from the death of a DPRK national in Kuala Lumpur on 13 February, 2017. 2. Both countries reaffirmed their desire to resolve the existing issues, based on the fundamental strength of their bilateral relations, which have been cultivated since the diplomatic relations were established in 1973. 3. Both countries agreed on the importance of respecting the Vienna Convention on Diplomatic Relations, and full implement the provisions contained therein. 4. As the DPRK has produced all necessary documentations related to the body of the deceased from the family, Malaysia agreed to facilitate the transfer of the body to the family of the deceased in DPRK. 5. Both countries agreed to lift the travel ban imposed on citizens of the other country and guarantee their safety and security within their respective territory. This would allow the nine Malaysians presently in Pyongyang to return to Malaysia and the DPRK citizens in Kuala Lumpur to depart Malaysia. 6. The importance of bilateral relations was reaffirmed. In this connection, both countries agreed to positively discuss the re-introduction of the visa-free system and work towards bringing the relations to a higher level. Dalam diam, kerajaan China bersetuju melabur berbilion-bilion ringgit di Johor..
Dlm diam najib curi duit 1mdb take tulis pun. Dalam diam, asset dan anggota ATM di hantar untuk membantu Arab Saudi mengebom Yemen, Negara Arab paling miskin di Dunia, sehingga tidak mampu miliki Tentera Udara sendiri. Dalam diam, Malaysia telah membantu Arab Saudi membunuh Rakyat Yemen... orang-tua, wanita & kanak-kanak. Dalam diam, Malaysia telah masuk-campur dalam pertelingkahan bodoh Pak-Pak Arab yang menguntungkan 'musuh' Islam. Dalam diam, Malaysia akan menjadi musuh kepada Iran dan Puak Syiah.